In the retail and hospitality industries, employees are usually taught early on that “the customer is always right.” But is this really a mentality that all of us should adopt? The short answer: not exactly. We’ve all seen what happens when you try to cater to an unruly client or demanding customer. You end up wasting precious time and resources that you’ll never get back. But we’re not here to discuss when to fire a client and when to keep one. We’re here to talk about the fact that your customer may not always be right, but their feedback is. Before we jump in, it’s important to consider why the idea of the faultless customer is a bit outdated. Let’s break down the phrase for a second. If we take the word “customer” out of the equation and just leave “is always right”, could you imagine someone in your life who truly embodies this? This particular person would have to be someone who not only knows the answers to everything, but also does no wrong. Even the smartest individuals will never be 100% right, 100% of the time. Sounds kind of superhuman if you ask me. Even the smartest individuals will never be 100% right, 100% of the time. It’s just impossible. So why are we giving our customers so much credit? Could they really be right all the time? That’s why it’s time to retire the old phrase and move along. 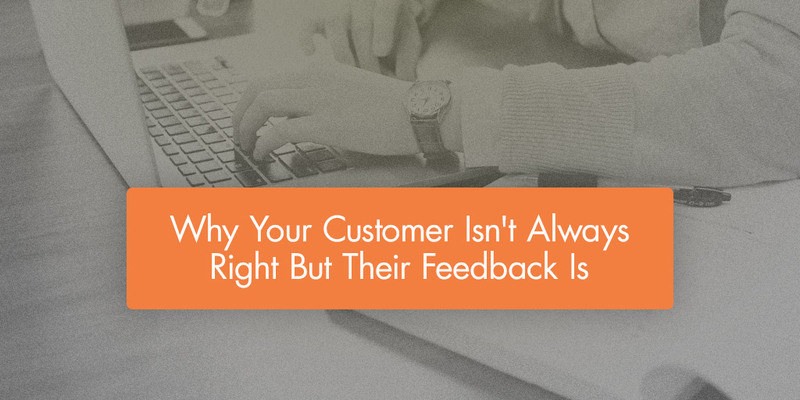 But there’s one aspect of this phrase that’s often overlooked: the customer’s feedback. Bonus: Find out how to get your customer’s feedback by downloading our free guide, “4 Things You Can Do to Generate Customer Feedback”. Find out what your customers really think and download our free resource, “4 Things You Can Do to Generate Customer Feedback.” Subscribe to receive this today! Giving your customer the power of always being right is not the answer, but listening to what they have to say is. In the moment, a venting customer can seem like an annoyance, but if you listen carefully, they could be identifying a flaw in your product or service that you may not have considered. Plus, if they’re having a problem, chances are they’re probably not the only ones facing this situation. Here’s the bigger issue: most customers don’t like to complain, and the majority never will. Put yourself in this scenario as the customer. You go out to a restaurant with some friends and order your meal. Yours in particular doesn’t come out as you expected. As everyone gushes about how great the food is, you’re stuck having to put on a phony smile and pretend that yours is just as tasty. Everyone at the table can sense your discontent and they may even encourage you to speak up and say something to your server. But you probably don’t feel comfortable doing this. After all, you don’t want to feel like a pain or have to wait for your correct order while everyone else is already eating. Or maybe you’ve watched too many undercover shows and now you assume that the employees may tamper with your food if you speak up. So you politely sit tight and don’t say anything negative to your server when asked about your food. The next time this restaurant is brought up, are you going to want to eat there again? I’m guessing it won’t be your first choice. Now think about one of your customers being dissatisfied. It probably doesn’t happen often, but you have to bet that a few of your customers have experienced this same situation. Maybe they’ll write off this bad experience as a once-in-a-blue-moon occurrence, or maybe they’ll write you off completely. You’ll never know if you don’t ask for your customers’ feedback before it gets to this point. First, it’s important to really listen to what the customer is complaining about. I’ll use the restaurant example again since most of us have experienced that issue at one time or another. In that particular situation, there could have been a number of different factors that led to the customer’s dissatisfaction. Was the food cold? Did it take too long to come out? Did the description match what the customer actually received? The fact is, in any given experience there could be multiple points of dissatisfaction. That’s why you’ll need to listen to your customer carefully to identify where the discrepancies are. To do this, step into their shoes as they walk through your entire interaction. For our restaurant example, ask your customer how the service was up until that point. If the service started out poorly, your customer may have already had a bad taste in their mouth long before the food arrived. And if you were to only listen to what was wrong with the food, you may not have a clue that your service should be addressed first,before the food. As you walk through the process in their shoes (by using their feedback), you’ll have a better understanding of the flaws you need to address throughout the entire process. A combination of these flaws may contribute to your customers’ unhappiness despite the fact that they’re only complaining about the final product (the food in this case). After you’ve seen how they interact with your business, it’s important to acknowledge their feedback. Some customers aren’t looking for a discount, so when you immediately offer a coupon for next time, they may feel that their feedback is not appreciated. So how can you show your customer that you listened carefully and truly heard what they had to say? By letting them know. Send your customers an update about recent changes you’ve made to improve your product or service. A simple, “We’ve listened to your feedback and can’t wait to show you how we’ve improved” email should do just the trick. Let your customers know that you value their input and even used it to make your product better. Remember, your product or service should be making their lives easier or better in someway. Be as transparent as you can here. I’m not suggesting that you let them know you fired that particular server, but you could mention that you’ve addressed issues like your average wait time and other concerns of that nature. If you’re a B2C company, you may even want to throw in a small discount that encourages them to give you another try. I know. I told you not to give them a coupon, and now I’m telling you that you should. So what gives? Well, it’s all about timing. Who wants a discount for next time if you’re so dissatisfied in the moment that you never want to come back again? When a customer complains and you immediately offer a coupon, they’ll feel like the discount was owed to them since they had such a poor experience. They may even take this one bad visit with them next time when they go to redeem the coupon and start the cycle of dissatisfaction all over again. But if you offer a discount after you’ve addressed their concerns, they’ll feel like the coupon was given as a token of appreciation. It’s like a “Thanks for your feedback, here’s a gift for your time” coupon instead of a “We’re sorry we messed up; please don’t leave us” coupon. In the end, the key takeaway here is to stop working by the outdated “Customer is always right” adage. Instead, you should focus on embracing your customer’s feedback as often as possible. And your team should, too. Focus on embracing your customer’s feedback as often as possible. Whenever you receive a complaint, look at the situation in a positive light: now you’ve been made aware, and you have the opportunity to remedy a particular aspect of your business that’s rubbing customers the wrong way. When you genuinely listen to what your customers have to say, walk in their shoes through each stage of the process, and acknowledge their feedback, you’ll have happy, loyal customers in no time. Bonus: Download our free guide 4 Things You Can Do to Generate Customer Feedback today!